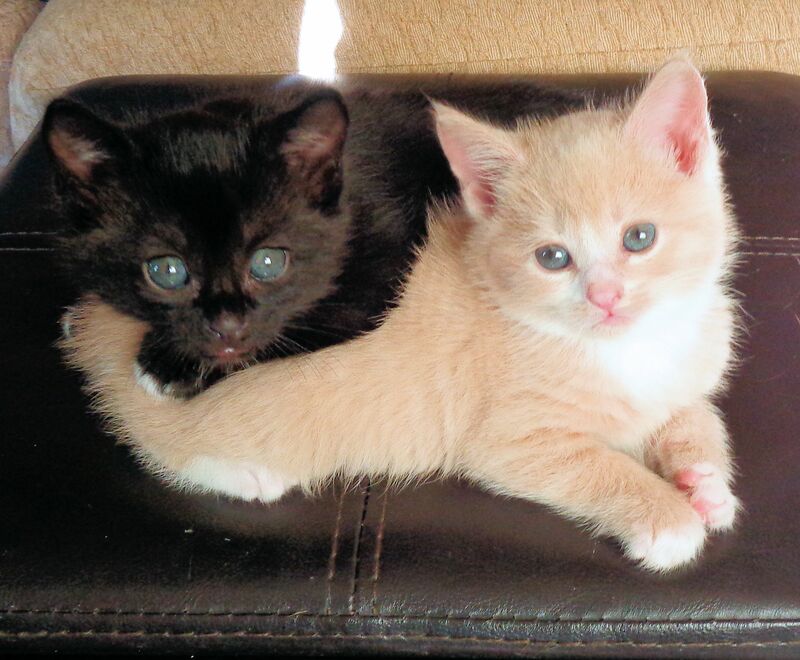 This is an update to the shivery tale I wrote of on the 13th. For those who prefer not to read about psychic experiences, just skip this entry. I am merely recording my perceptions, my actions and what occurred as a result. A week-and-a-half ago, when the family was out of the house, I went to the neighbors to deal with their troublesome entity. 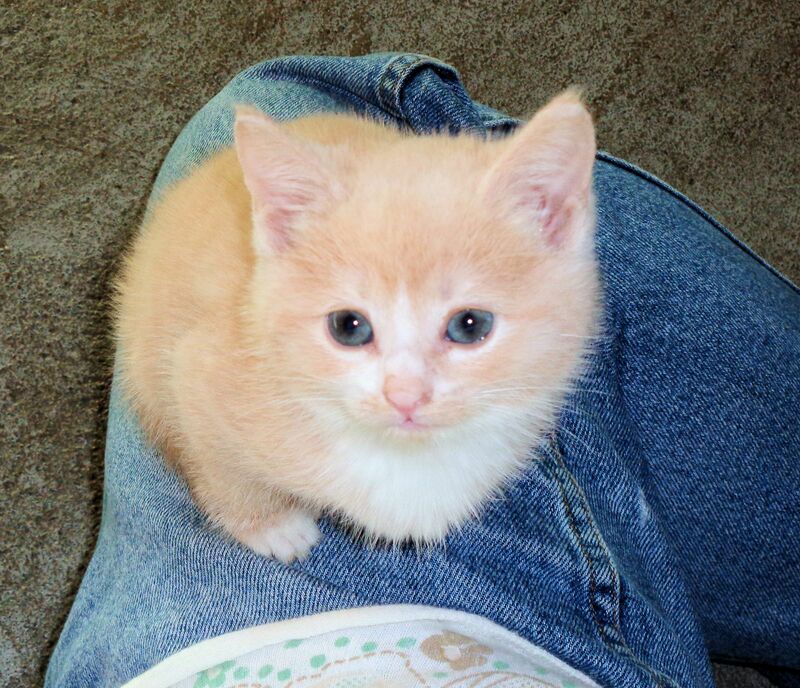 Prior to my visit, I met with a gifted psychic. I like to get her impression of the entity I will be contacting. In this case she felt the ghost seen by the neighbor child was a man who was hesitant to pass over due to his misdeeds in this life. The psychic warned that this ghost was not benign. He had ill-will toward the child and was oppressing her. I suspected the oppression extended to the others in the home as well. 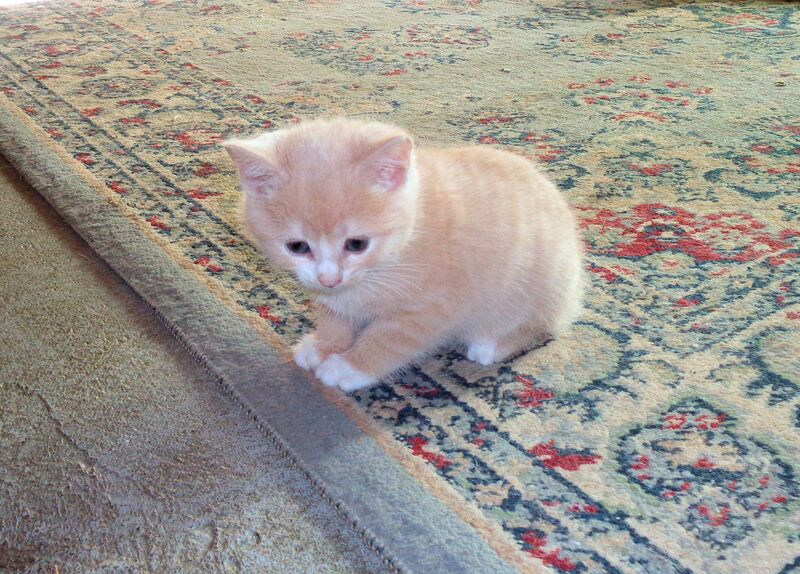 After several days of energy building, I entered the house. As always, the place felt heavy and dark to me. I frequently get this sensation in areas that have hosted many years, or layers, of lives. 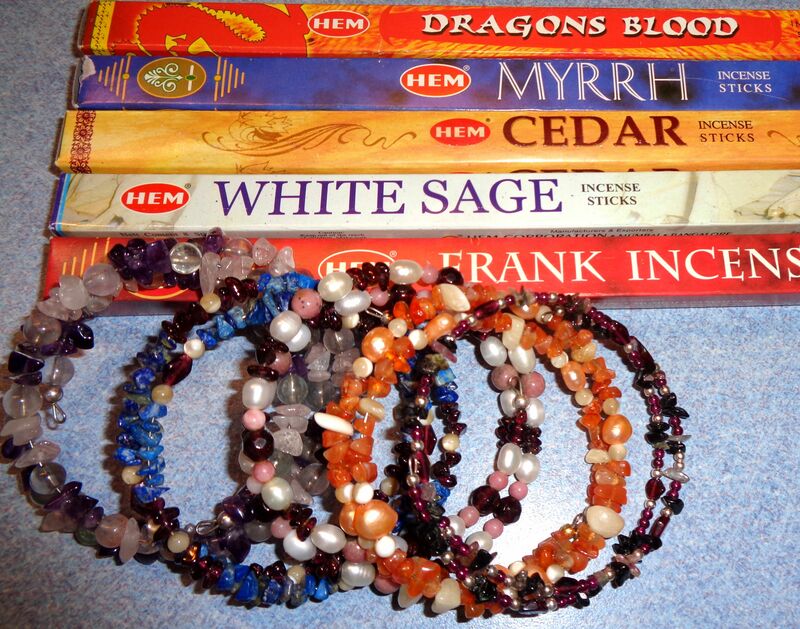 Wearing various crystals that are supposed to improve my vibration, I proceeded to cleanse the house. Everyone has their own method for smudging. I light several sticks of incense and carry them with a bowl underneath to catch the ash. First, every door and drawer is opened so the incense smoke will flow freely. Beginning on the north wall of the cellar, I blew the smoke toward the corners of all the walls. It is important to make your intentions clear by chanting (I mostly chant silently) a benediction sanctifying the house to the light, that only good may remain. Because I suspected the long, dark crawl space in one part of the cellar was a good hiding place, I spent several minutes blowing smoke in the hole. It was a still day and it took plenty of lung power to move the incense into the space. Suddenly the smoke was blowing back in my face instead of moving away with my breath. I felt something flow past me out of the crawl space. I continued to smudge the cellar, then went upstairs to sweep the main floor. Smoke had to be sent into every nook and cranny; the tiny attic space, every closet, even into the oven and microwave. Then I sealed every entryway with finely crushed Himalayan pink salt. Last, I sat at the table with the incense still smoking, lit a white candle, read aloud the 23 Psalm (my favorite passage) and rang a small, high pitched brass bell. Then I concentrated on listening to whatever entities were present. I got the distinct impression of two individuals. One was an older male named James who was from around the 1840s. The other was younger, a child. I’m not sure if it was male or female. This entity had been there considerably longer than the James person. I informed both that they were dead, no longer meant to be in this place. I enjoined them to think of their loved ones and to look toward the light. I saw them take the hands of those who came with the light for them. When they had left, the house felt brighter and lighter as though a weight was lifted. I closed all the doors and windows. Before I left the property, I buried the remains of the incense in the snow to end the communication. Then I waited to hear about any changes the neighbors noticed. A week later I spoke with them. The shadows seen from the corners of their eyes had disappeared immediately. Since the day of the cleansing, there had been no more tampering with the controls for the woodstove, something that had been happening every night. The child no longer heard noises in the closet, saw toys moving or had her hair touched. She was sleeping all night in her room without nightmares. The father said the house felt more cheerful to him. This is a chilly tale for the dying end of the year and the rattly-cold bones of December. One of my neighbors is a little girl of ten. I will call her Jill. She is cute and sweet and very personable. I learned that, much to everyone’s surprise, Jill’s first report card for fifth grade included two failing grades. She had always brought home good report cards, As and Bs, mostly. No fails. Since I have experience with tutoring, I offered to help Jill a couple times a week with her homework. Assistance was needed for math and social studies. Math was her worst subject. For those who have encountered it, this is Common Core Math. Just the name can be scary! I did some quick brushing up on Common Core math and realized it’s not very tough. Seems the education planners of America want students to learn how to do math in their heads rather than with paper and pencil or…gasp…a calculator. Once attempted and understood, Common Core is just like every other type of math: an exercise for the mind, similar to a game. For those who advance on in the Sciences, math is an essential tool. For the average Joe, math is great for figuring out change, making sure the boss got your paycheck right, or perhaps useful in a home carpentry project. It’s nice to be able to at least have an average showing in math. Failing the subject is not so good. The first several lessons with me, Jill struggled. The biggest problem seemed to be her inability to concentrate. She could not recall information she had just heard. The poor child could not remember how to do a long multiplication problem from one example to the next. Forget long division, a nearly impossible feat for her. Yet, she knew her times tables nearly perfectly. She was a good reader, although her vocabulary and spelling needed work. What was going on here, that suddenly a child who could memorize multiplication facts could not remember what she had learned from one problem to the next? Her attention span was only seconds long. She started yawning after about ten minutes of math. I began to suspect that Jill had a problem with getting enough sleep. Children can’t concentrate if they are sleep deprived. Her parents verified that she often went to bed late and then woke in the middle of the night. Multiple times per week the parents would be roused by Jill sitting on the floor in their room watching tv in the wee hours of the morning. They did not know why. I decided to ask the child. What she told me came as a surprise. She was afraid in her room. There were noises at night, scratching and scampering sounds like mice in the closet and on the shelves. 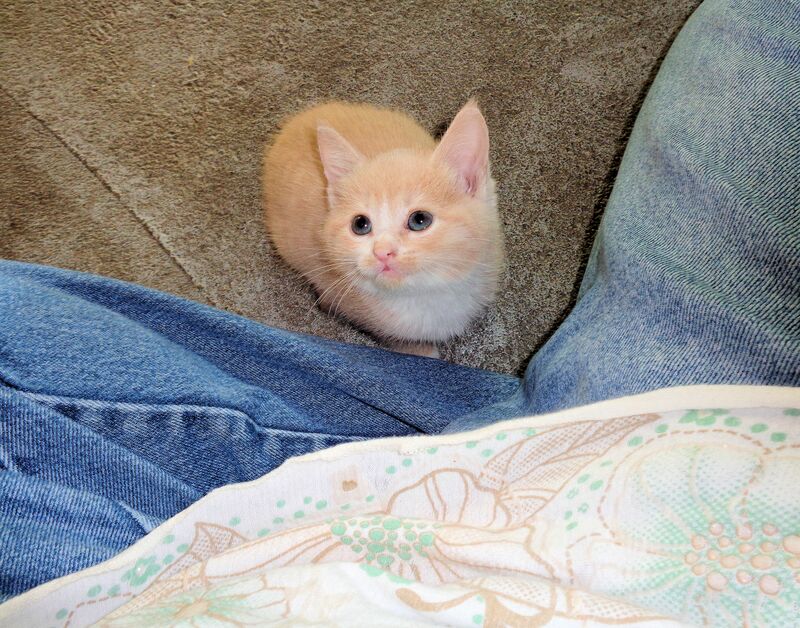 Her cat, who slept with her, would hear the noises and investigate. It never caught a mouse or other critter. The toys in her room would move on their own, rocking and sometimes falling over. She could see dark shapes passing around her from the corners of her eyes. And worst of all, something played with her hair. Locks would be lifted in the air and often pulled by an unseen hand. Jill had told her parents she was afraid of noises in her room. She asked her dad if he believed in ghosts. Yet she did not elaborate on the subject and seemed to accept pedestrian explanations for the noises. Then I learned she had seen an actual ghost several times. There was an old man sitting in a chair out on the back lawn. He would wave to Jill and when she returned the gesture, he would smile. The first time she observed this apparition, she was less than three years old. When she asked her mother who the man was, her mother could not see anything. Perhaps that was the beginning of Jill keeping the things she saw and heard to herself. Unfortunately, by the time she got to be ten, these things were affecting her school performance. She could not sleep at night because the ghost, as she called it, would not let her. Determined to help Jill, who is only an innocent and defenseless child, I set out to learn what I could. I told the parents just what was going on. They were receptive to the extraordinary story and the dad admitted he saw shadows walking around all the time as well. Articles often went missing, and strange, unexplained occurrences were a regular part of life for the family. The home where Jill lives is built on the foundation of a house that burned. The rock-walled cellar must be at least two hundred years old. The home and land have been in Jill’s family for many generations, so the entity troubling her could well be an ancestor. I have taken it upon myself to help Jill and her family. With several episodes of dealing with ghostly visitations under my belt, I can offer some support and assistance. In addition to instructing in school work, I am also Jill’s new psychic tutor. Primarily, I am a confidant whom she can trust and who has the personal experience necessary to draw out the fears she has kept hidden. I’ve taught Jill how to protect herself from being intruded upon by entities when she is sleeping. She has also learned that she can speak to the ghost, telling it to go away and leave her alone. This entity may be following her. She described an event that happened this week in the school library. She was reading by herself and some invisible person started plucking hairs out of her head, one at a time. Ouch. She told it to stop. She must have said it too loudly because the people nearby gave her strange looks. The girl likely has psychic potential and may be a magnet for entities throughout her life. I want to help her understand and accept who she is, and how to control her abilities to protect herself. Maybe one day she will choose to pursue honing her psychic gifts. In the meantime, I will consult with a learned psychic who has advised me in the past before I attempt to contact and move on this lingering ghost. My hopes are that within a couple weeks the problem can be cleared from my neighbors’ lives and Jill may once again bring home great report cards. This accident happened a few days ago on our road. We own about one-third mile frontage on Rte. 139. It is a high speed road with vehicles routinely traveling in excess of 70 mph. The speed limit is 55. The route connects the western part of the state with the interstate highway system and it sees more than its share of heavy truck traffic, speeding commuters and tourists in a rush. The volume of traffic passing our house on this road is higher than the volume of traffic moving through our town on the interstate highway. Hard to imagine there are so many vehicles roaring by our home every day. But, it is true, the state has done traffic surveys. Rte. 139 is a wide, well-built roadway with full breakdown lanes so that four vehicles could pass abreast, if they tried. The accident occurred around 4 pm, just before twilight on a clear, dry day. There was plenty of daylight. I was in the house and heard two huge bangs very close together. Since loud road noise is a fact of life here, I didn’t think much of the bangs until traffic started backing up by the house. Checking out a window, I could see vehicles parked in the road with their emergency flashers going. Looked like the trouble was about one-quarter mile away. I walked up through our orchards and found one small SUV sideways in the middle of the road (seen in the photo above,) a tractor-trailer rig stopped about 200 feet down the road and a van backwards down the slope from the road in our woods. The SUV was smashed front and rear and the van had the front end crushed. A tire had come off the trailer of the 18-wheeler and rolled down the road at high speed to strike an oncoming car. All traffic was at a standstill. The driver of the SUV was trapped in his car. He was moving around inside, but could not get out. The van driver was out and seemed ok. The semi driver was unhurt as were the occupants of the car hit by the tire. No one could get the doors of the SUV open. The SUV was steaming from a broken radiator. Luckily none of the vehicles was in danger of fire. As I studied the damage and situation of the various involved vehicles, I could guess at what happened. The SUV was stopped in the road, waiting to turn left up a driveway. The van driver somehow failed to see the blocked lane and slammed into the rear of the SUV at high speed. I couldn’t see any skid marks on the road that would indicate braking by the van. The impact from the collision drove the SUV into the first rear tire of the 18-wheeler, which was also likely going at highway speed of at least 50 mph. The truck would have been just regaining speed after climbing a short hill. The force of the SUV tore the truck tire from its mount and sent it careening down the road. It rolled at least 100 feet before striking the car. Luckily, it was just the tire without the heavy steel rim. The van was whipped sideways by the collision and sent slipping backwards down our hillside until our trees stopped it some 80 feet from the road. The slope is steep, about 40-45 degrees. How the van driver could have not seen the turning car and maneuvered around it in the wide breakdown lane is beyond me. The first crash I heard was the van hitting the SUV. The second was the SUV hitting the truck. We live eight miles from town. It takes fire and police at least ten minutes to respond to accidents out our way. People were doing what they could to help the accident victims. The road was completely blocked, the endless traffic piling up for miles on both sides of the crash. Finally we could hear sirens in the distance. Before long rescue had secured the site and police were routing cars on a detour. It took about an hour to extricate the SUV driver. A firefighter and a police officer told me everyone in the accident would be all right. After I heard no one lost their life, I began to think about what was lost. The van and SUV were obviously totaled. The trailer truck could be repaired. The car hit by the tire was not too badly damaged. Our land was damaged. The broken van destroyed a small ash tree that stopped its descent. The van then sat leaking oil and antifreeze for three hours. Smashed plastic, metal and glass was scattered over our property. When the van was finally towed out of the woods, it left a trail of oil and anti-freeze all the way up to the road. 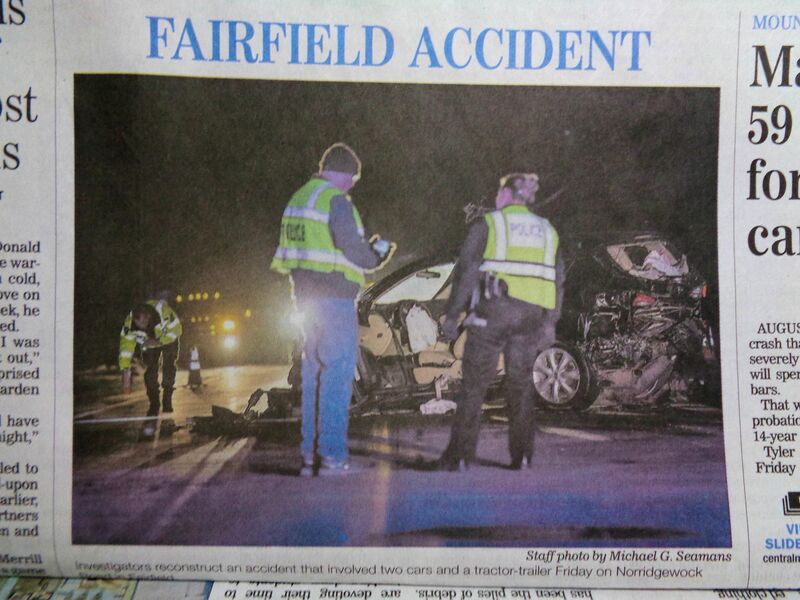 This accident is at least the sixth I can think of that has occurred on our land in the last thirty years since the old road was rebuilt and turned into a high-speed, high-volume connector. Every accident has resulted in some sort of damage to us. Killed trees, rutted fields, leaked fluids, debris strewn far and wide. We get to clean it up. We never hear from the individuals involved in the crashes. There is no compensation for our time or aggravation. Who gives a second thought to the property owners damaged by irresponsible drivers? The destruction is not at a level that makes a court claim worthwhile. How do I charge a driver or insurance company for the polluting fluids leaked on my land? Or the time and energy it takes to fill in the foot deep channels left in a soggy field after a car goes across it? Or how about the effort required to pick up thousands of large cotter pins spilled from a truck that rolled into the orchard? Not to mention hours spent collecting bits of smashed plastic, glass and metal car parts or the cost of disposal. The giant truck tire is still lying beside the road near our grape vineyard. It will likely be there till spring when the state cleaning crew makes a hurried pass through our area. No, our sort of injury does not make the pages of the newspaper. Rescue and police personnel do not clean up wrecks beyond towing away the large bits and sweeping the small bits to the roadside. It’s difficult to not feel considerable resentment for the road and the traffic. Beyond the noise, air pollution and thoughtless littering from thousands of vehicles, there is always accident cleanup. My daughter and I just returned from a twelve-day trip to England to visit my mother, who has lived in the UK for about thirty years. Usually the trip involves tours of local attractions. This year we went to the town of Sandwich, located near the English Channel between Margate and Dover. At one time Sandwich was one of the greatest ports in England and is still one of the five Cinque Ports designated by the Crown to protect the coast. 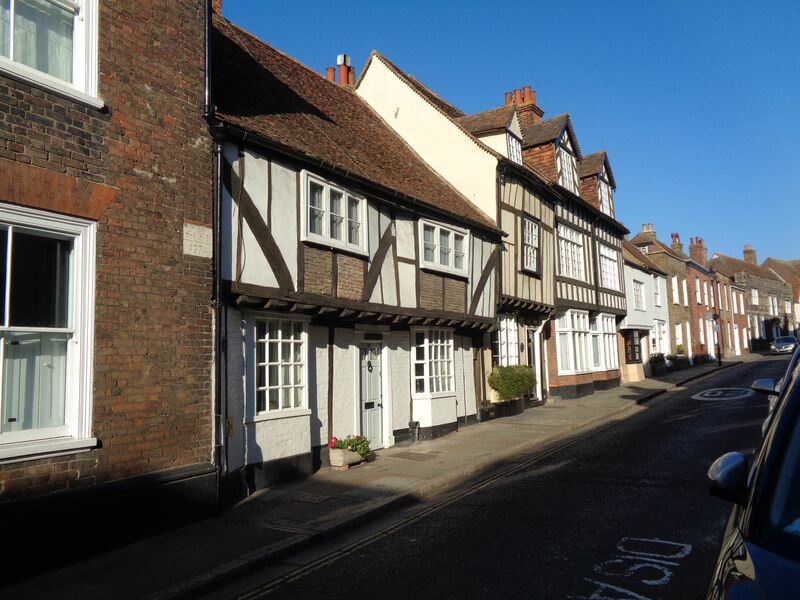 Sandwich is renowned for containing some of the most complete sections of medieval town. Tourism to view the antiquities began in the 1700s and has not abated. 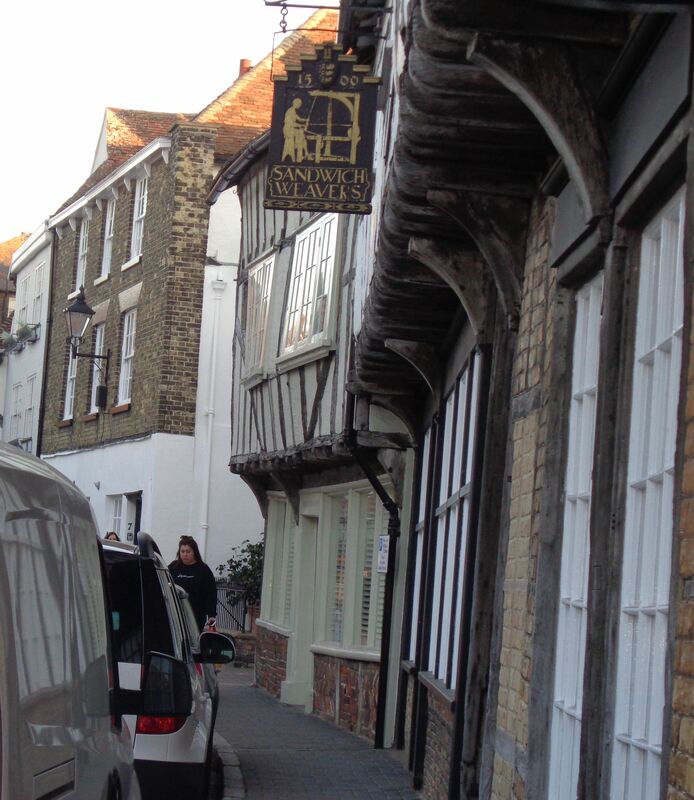 We stayed at the King’s Arms, an inn built in 1580 on Strand Street. 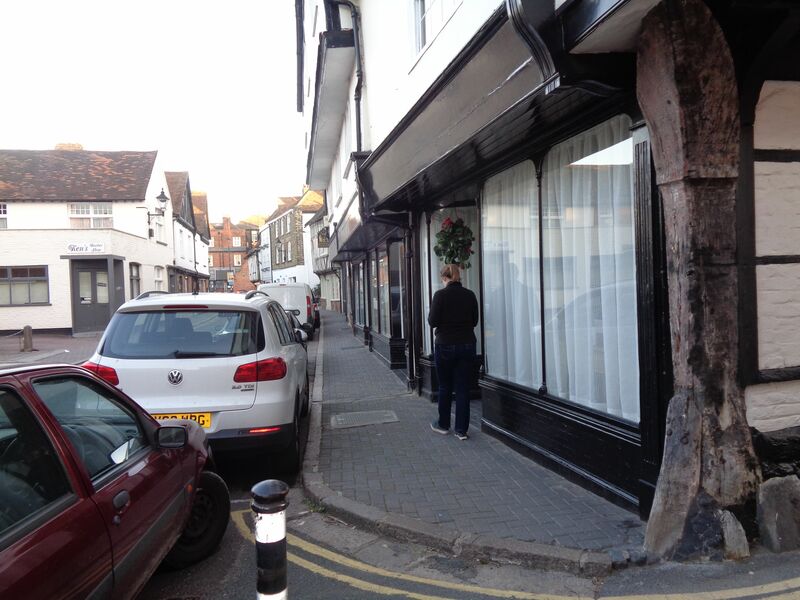 At that time the street fronted the Stour River. Since then so much silting-in of the waterway has occurred that there are houses with large backyards on the river side of the street. 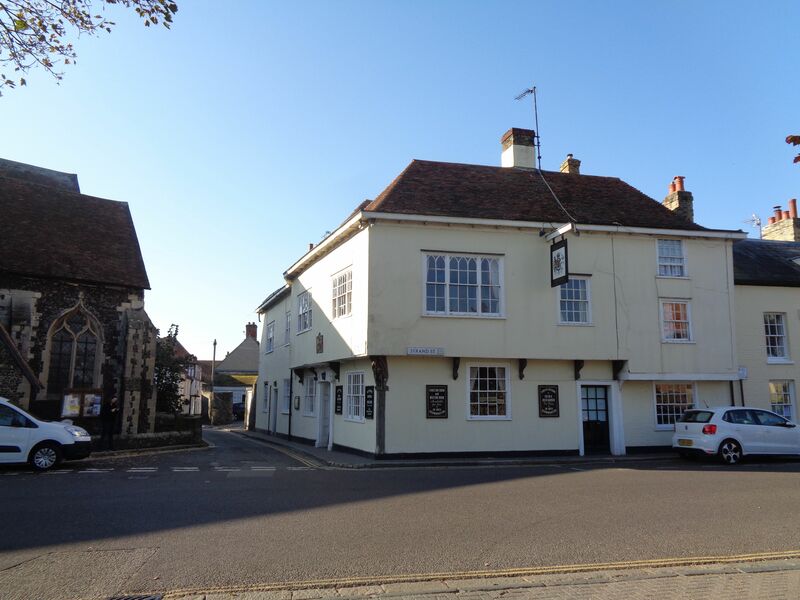 The inn was originally called the Queen’s Arms and named for Elizabeth I who visited Sandwich. The name was changed in 1687, during the reign of James II. The inn is a charming and largely original structure. Features such as the cheerful common room with its giant fireplace, huge exposed wooden beams throughout, narrow, steep staircases, and door clearances under six feet high are all proof of this house’s nearly 450 year history. Our room was number three and our window was the middle one with the orange glow above the parked car on the right side of the first photo. The elderly single glazed window was quite drafty. Luckily the weather was warm during our stay. We had a large, comfortable room with a fireplace that has been closed up. The included full English breakfast was very good. The psychic in me is certain residuals of long-gone lives still remain in our room and in the entire building. 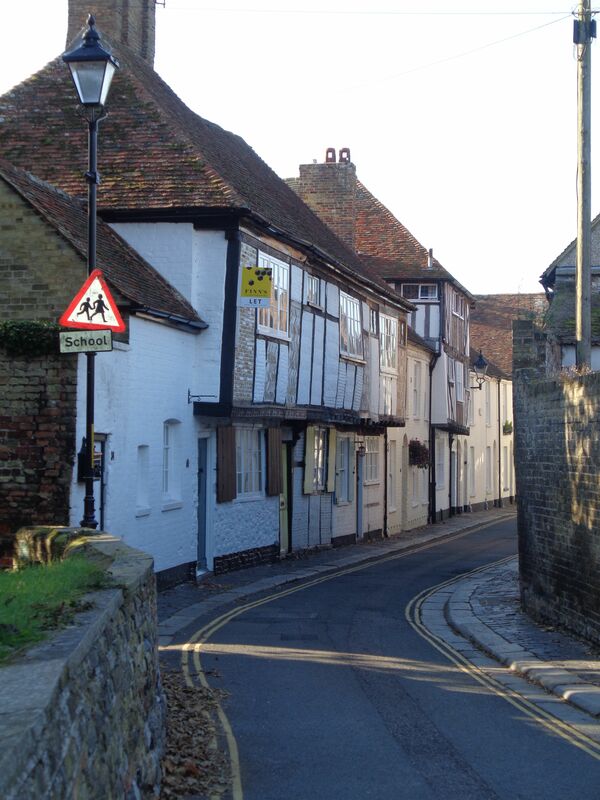 Many of the streets in Sandwich are like the one above. It is single lane, yet accommodates two-way traffic. Medieval buildings crowd close, their jetties overhanging the sidewalks. The lane above, Church Street, runs between the King’s Arms and St. Mary’s Church to intersect with Strand Street. Walking along the streets can be challenging as the traffic is sometimes heavy and the sidewalks are narrow or non-existent. Many are roughly paved with cobbles. Sandwich has a long history. It began as a small settlement on an island in a large, deep harbor. In AD 43 the Romans established Rutupiae (Richborough) on this harbor. The population of the area rapidly expanded as the army used Rutupiae for their base in the conquest of Britain. Sandwich, once known as Lundenwic, stood near the harbor entrance to the wide, deep, important Wantsum shipping channel that ran all the way to London from the sea. Massive storms with tidal wave surges deposited so much silt with major flooding that the harbor was partially filled in, leaving Richborough high and dry and making Lundenwic the new port town. After the Romans left, and the Saxons were invaded by Danes, the name was changed to Sandwic, meaning sandy town. Over time the name morphed into Sandwich. In the 900s, the town moved to higher ground as continued silting formed a peninsula from the original island. The channel remained deep enough for large ships. By the eleventh century Sandwich had become a major English port with a large population and great wealth. In the middle of that century it was designated a Cinqueport with obligations to provided armed sailing vessels and fighting men for the king in times of war. In return Sandwich received money from surrounding towns to help with the arming of vessels and men, and privileged trade with the continent free from customs and tolls. Ever at odds with England, France staged several raids on Sandwich. In 1217, they burned much of the town. A toll ferry carried traffic across to Thanet until a bridge was built. A version of it stands today. The structure was originally a drawbridge but was rebuilt as the current single lane swing bridge. 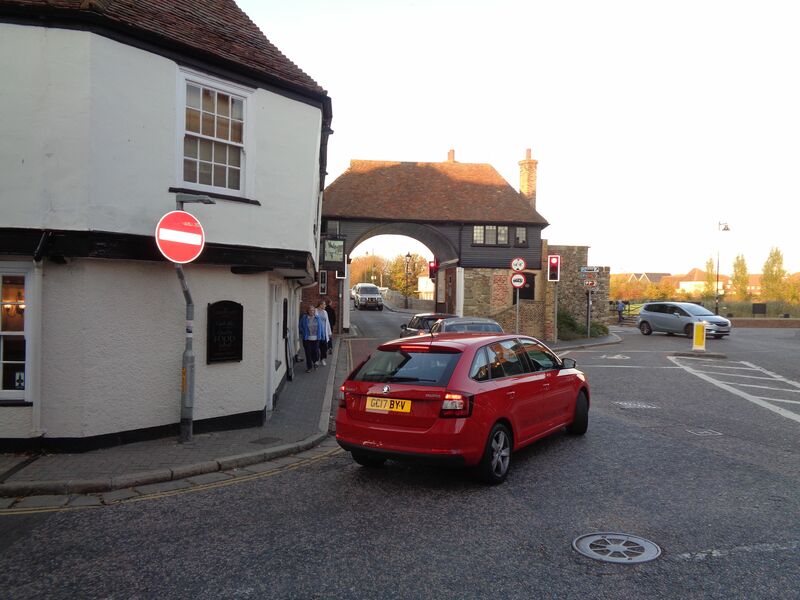 Traffic approaches the bridge through the Barbican or David’s (Davis) Gate (photo above.) The town had been granted the right to have its own municipal court as a cinqueport privilege. A Guild Hall with a court room was constructed in 1359 that still stands today. The town had a mayor and all the eligible men of voting age participated in town business including serving on juries. The Great Storm of 1287 brought a devastating tidal wave storm surge carrying so much silt that the harbor was filled in. The river remained deep enough for good sized ships to navigate so Sandwich continued as a port two miles inland from the sea. 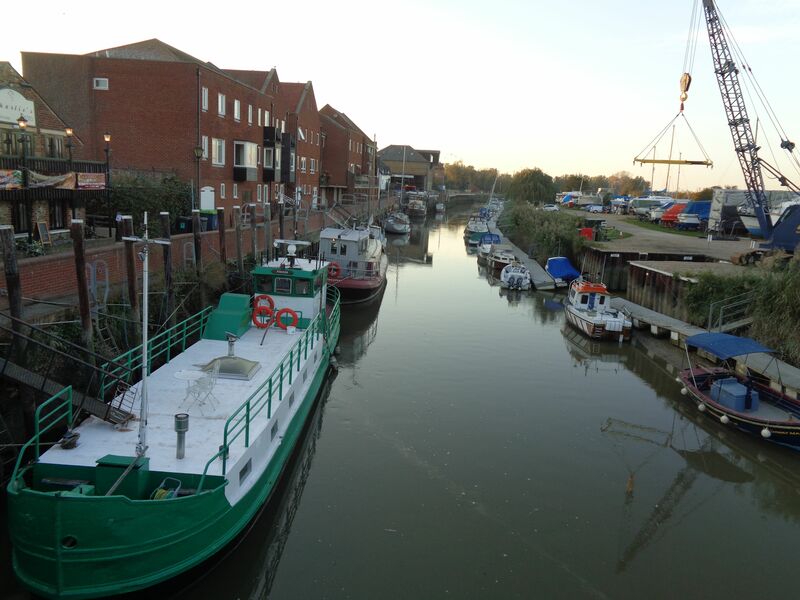 A wide place in the river called Sandwich Haven provided safe docking for trade ships. The French attacked several more times including in 1457 when the mayor was killed. Since that time all the mayors of Sandwich wear black robes of office to signify mourning. In the 1450s the king became so concerned about attacks by the French that he ordered the town better fortified. More and higher walls were built and stronger gates. The end of Sandwich’s days as a port city occurred in the late 1550s when Pope Paul IV lost a large ship. It sank right at the mouth of Sandwich Haven. Soon silt and sand built up around the wreck effectively stopping up the entrance to Sandwich for large trading vessels. Attempts to cut a deeper passage failed. In the 1560s, craftspeople escaping religious persecution in Flanders and France came to England. Queen Elizabeth granted the refugees licenses to set up shops and manufacture in different parts of England. Several groups of Dutch weavers moved to Sandwich and began manufacturing broadcloth using wool produced in Kent. They employed small vessels to carry their goods out to markets. This created a boom for the Sandwich area. The photo above is of the Sandwich Weavers building where the Dutch sheltered when they arrived in the area. Over time many of these weavers became wealthy. 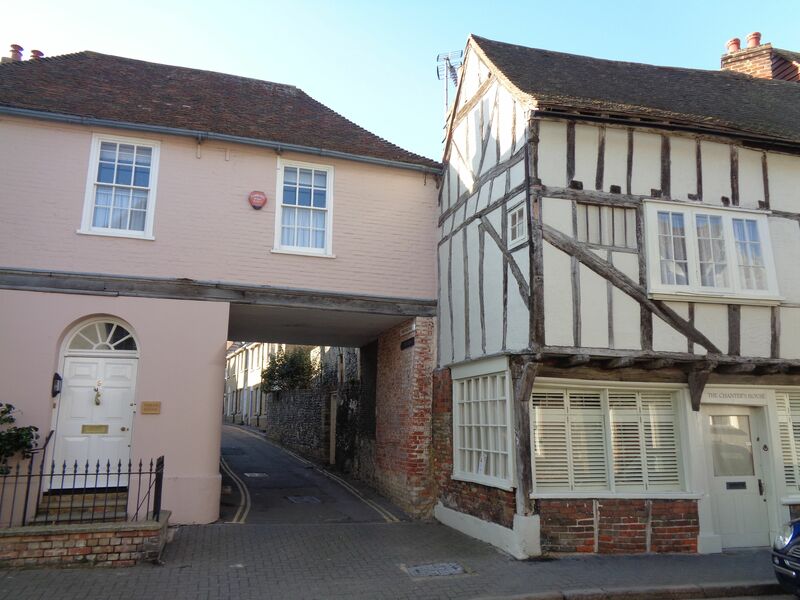 The Dutch influence in Sandwich can also be seen in architecture, ditches, drainage works and farm fields. Because the area was once part of the sea, it is low, flat and damp. The Dutch had experience with such conditions. They drained fields to create farmland and grew crops such as grains, carrots and celery in the sandy soil. A ditch called the Delf (Old English for ditch) and connected sluices were added in an attempt to bring better water to the town. It was notorious for unhealthful conditions due to fouled drinking water. Today the sluices can still be seen, stagnant water filled with duck weed and looking like tiny canals standing below street level in front of homes. The Delf did not improve conditions as people continued to foul the open waterways and contract illnesses. An attempt to pump in clean water failed in the 1620s. The town didn’t have reliable clean drinking water until the late 1800s. Prosperity brought by the Dutch began to fade in the early 1600s when King James I set up a company of merchants and granted them sole rights to trade in Europe. With its commercial life strangled, Sandwich faded as a port for anything but the superior crops produced in the area, including its famed carrots. Poverty became a problem for the locals until tourism began to restore some employment. The town drew visitors to its quaint, narrow streets and blocks of antique houses. The fourth Earl of Sandwich, John Montague (1718-1792) is fabled to have eaten meals made of slices of meat between pieces of bread while gambling in the Guild Hall around 1762. The sandwich is named for him. In 1759 Thomas Paine lived for about a year on New Street in a small brick house. He had settled in Sandwich after marrying. His wife died a year after the marriage. He later departed for the American colonies and found fame there as a patriot. Today Sandwich has much to offer visitors. 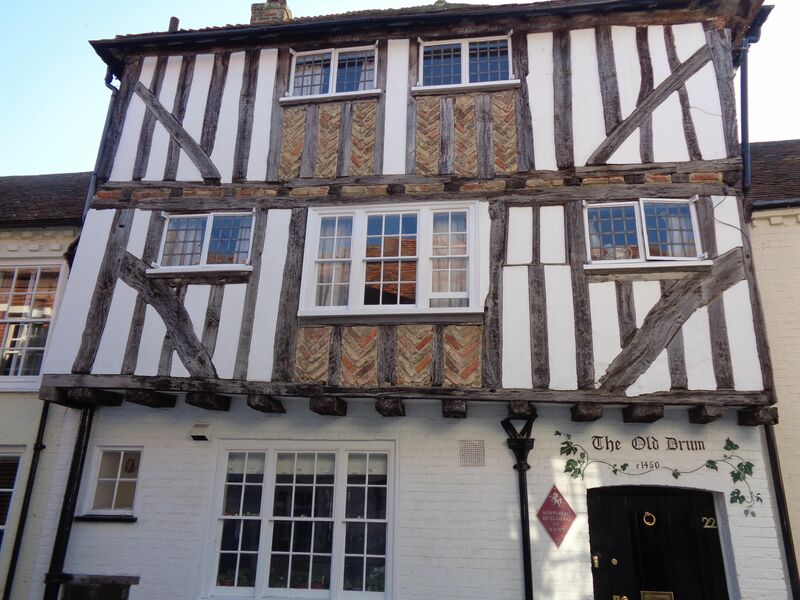 Experience the adventure of staying in a medieval inn, take a leisurely stroll on the walkways by the Quay, enjoy a meal in one of the many fine establishments, amble through the ancient streets or hike along a segment of the well kept Coast Path which passes through town on its way around the entire southeastern seaboard. Sandwich has something for everyone. When people travel, they often like to sample the authentic flavors of the places they visit. Well, you can’t find a more authentic Maine establishment than Karen’s Hideaway on Rte. 27 in Boothbay. Conveniently located for tourists right on a main artery to the ocean and all the coast has to offer, don’t blink or you might miss it! After Shore Hills Campground, keep watch on the left. 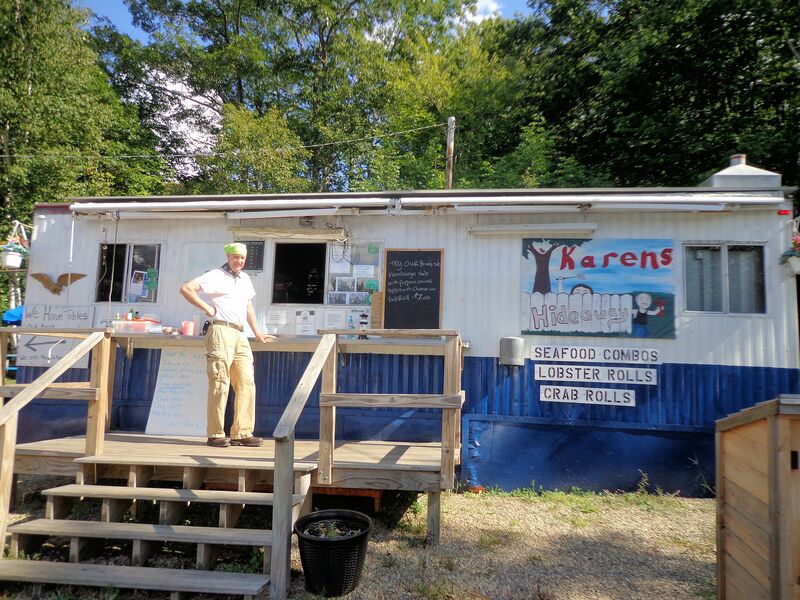 Karen’s food trailer is across the road from Adams Pond and parked next to the Maineiac Fresh Seafood shop. This is where she gets the ingredients for many of her delicious offerings. 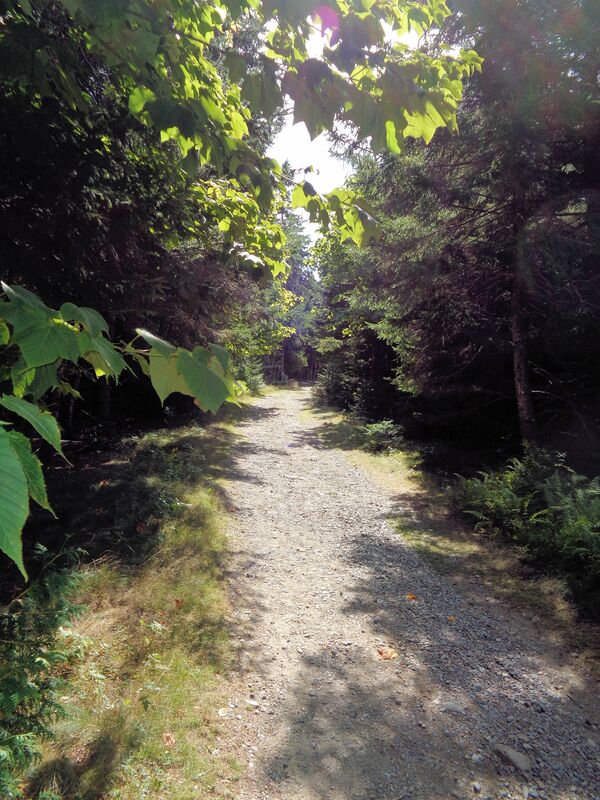 We found Karen’s a couple years ago when we were hungry after a long walk on the ocean-side trails that abound on Cape Newagen, also called the Boothbay, Peninsula. Being an epicurean adventurer, I’m always ready to try a new place to eat. My husband Tim’s motto is “I can get a hamburger anywhere.” We were both very pleasantly surprised at the amazing food served up by this humble kitchen. You know the seafood is going to be super fresh. It is caught daily and brought over to the lunch wagon from next door. I ordered the crab melt basket and Tim got the burger basket. If you ever go to Karen’s don’t make this same mistake unless you are extremely hungry–lost in the woods for a week hungry. The baskets are served with an overflowing heap of the best french fries around. They are thick, crispy outside, and soft inside with no trace of oiliness. I can’t believe we managed to eat all those fries except once you start, you just can’t stop. 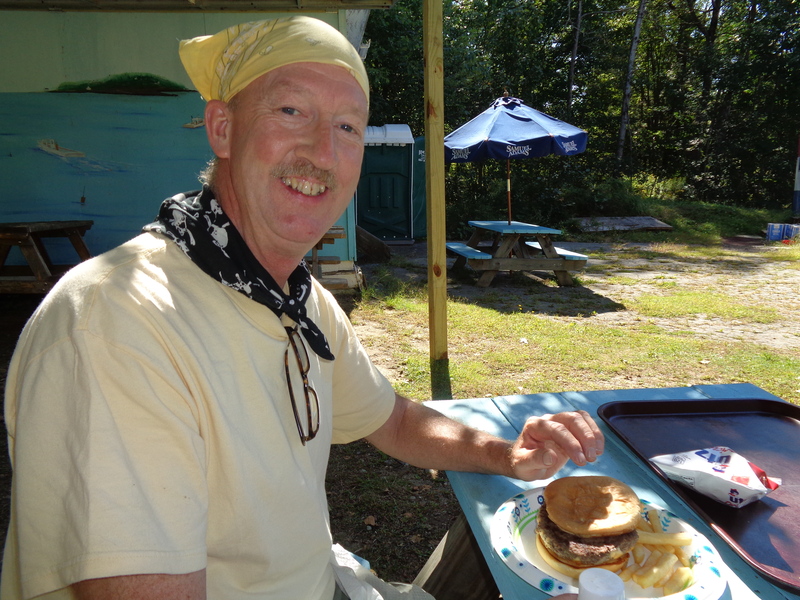 Tim’s cheeseburger was comprised of 12 oz of fresh ground beef on a big, soft bun. He put it all away! My crab melt was made with two pieces of Texas toast from the grill, stuffed with an obscenely generous amount of fresh crab barely held together with mayo, and topped with melted swiss and American cheese. 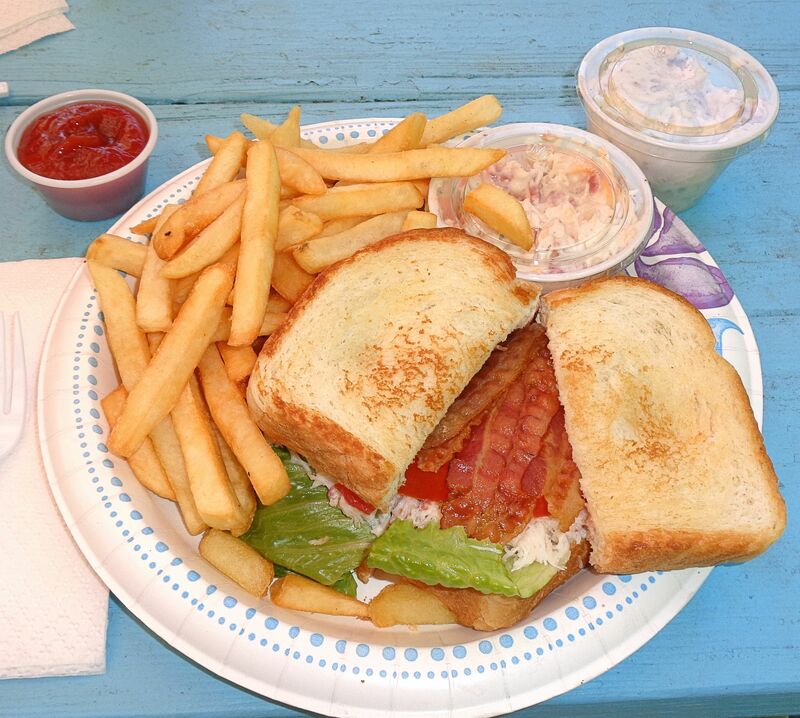 When I’m feeling really adventuresome I get the crab melt with bacon, lettuce and tomato, so yummy! The fries in the photo below are just a small portion of the total provided. On the side are served a choice of Karen’s pineapple coleslaw ( I usually skip the coleslaw, but not this one, it’s divine!) or her loaded baked potato salad. I can’t find enough descriptors to do justice to the deliciousness of the spud salad! It is filled with cheddar cheese and bits of bacon with hints of real baked potato in the skin and sour cream. Since Tim doesn’t like anything with mayo on it, I get both the sides, yay for me! You place the order at the window with Karen, a gregarious lady with a ready laugh and sharp Maine wit. 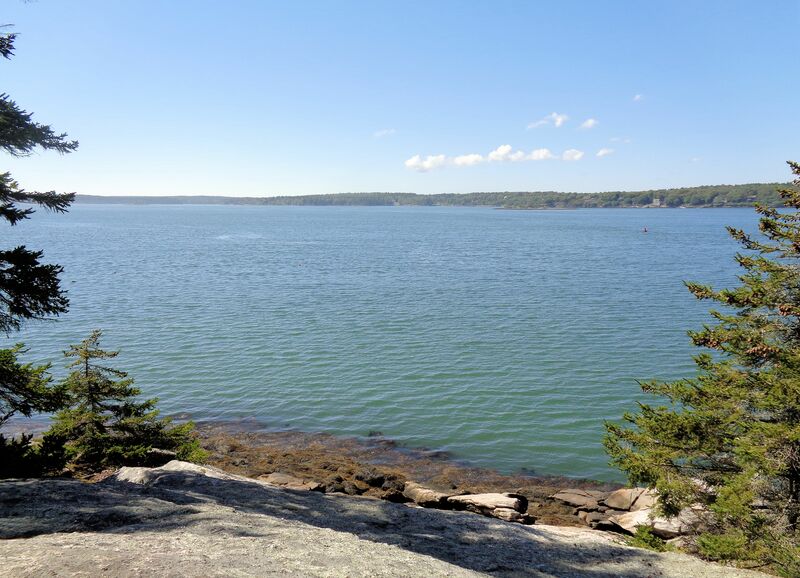 When we told Karen our trip to Boothbay was an anniversary celebration, she confided that she and her husband had been married even longer than our 35 years. I suspect her husband runs the seafood shop. Ordering is done from a laminated menu. Be careful to specify whether or not you want a basket or you will be inundated with fries! One basket meal provides plenty of fries for two. While the food cooks, patrons enjoy the authentic Maine atmosphere up back behind the trailer where several tables with umbrellas are arranged in a small clearing in the woods. A resident chipmunk will keep you company. Note the proximity of one table to the portable outhouse, dining at its finest for the tough Maine natives who happen by. The wall of a nearby shed has been painted with a scene from the Boothbay coast, it’s almost like eating right at the shore. When your number is called, your meals are presented on a tray for ease of transport back to the picnic table. After such a satisfying repast, we are usually ready to hit one final hike before heading home. On our last visit we enjoyed a stroll on the Cross River Preserve trails and were rewarded with this view of the Cross River. 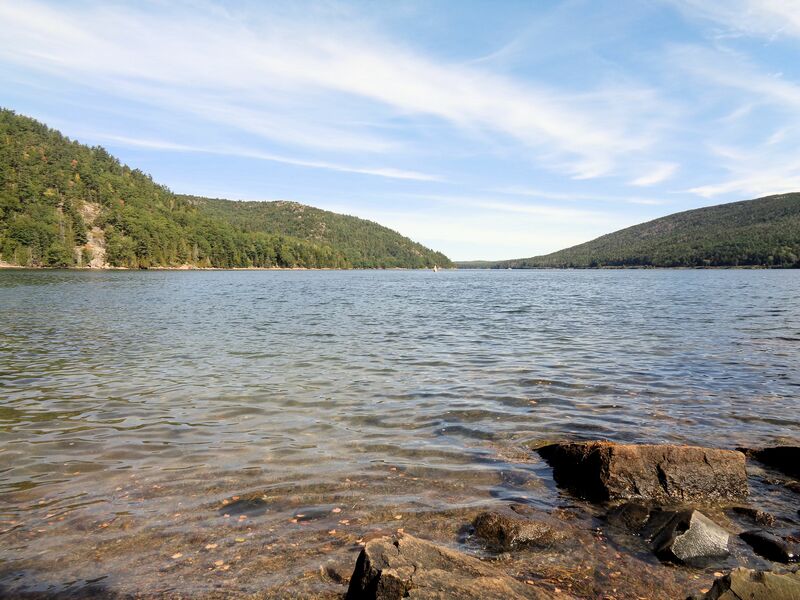 The first week of September my husband and I celebrated our 35th wedding anniversary with our customary trip to Acadia National Park. We camped overnight and did a lot of walking. By day two our aging knees wanted a break. We opted for a nice, easy morning hike. 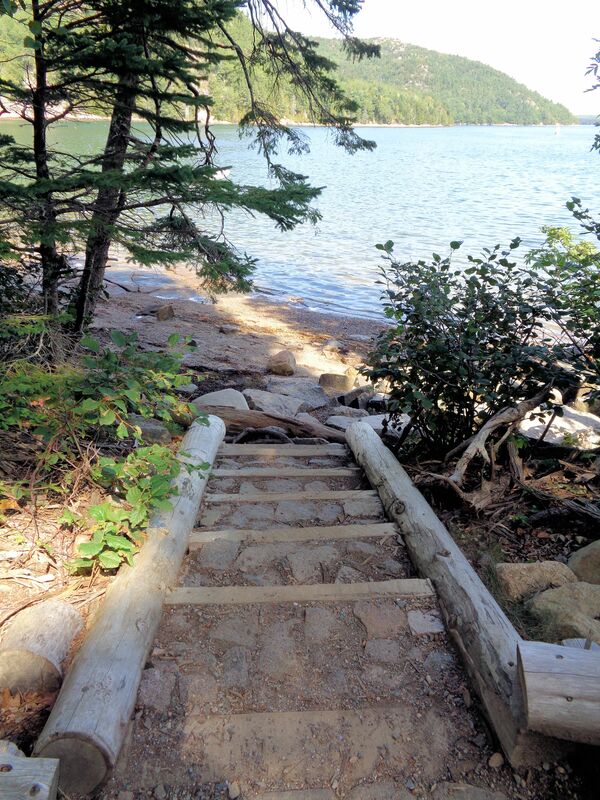 There are not many easier walks in Acadia than the Fire Road to Valley Cove, a one-half mile path to the ocean. The valley in the name refers to the space between two small mountains, Flying and St. Sauveur. The trail is wide, graveled and well maintained. Yet, it is a quiet and isolated spot, seldom frequented. Trees push close, providing shade from bright mid-morning sun. Cicadas and crickets add their high-pitched music to the ripe September day. 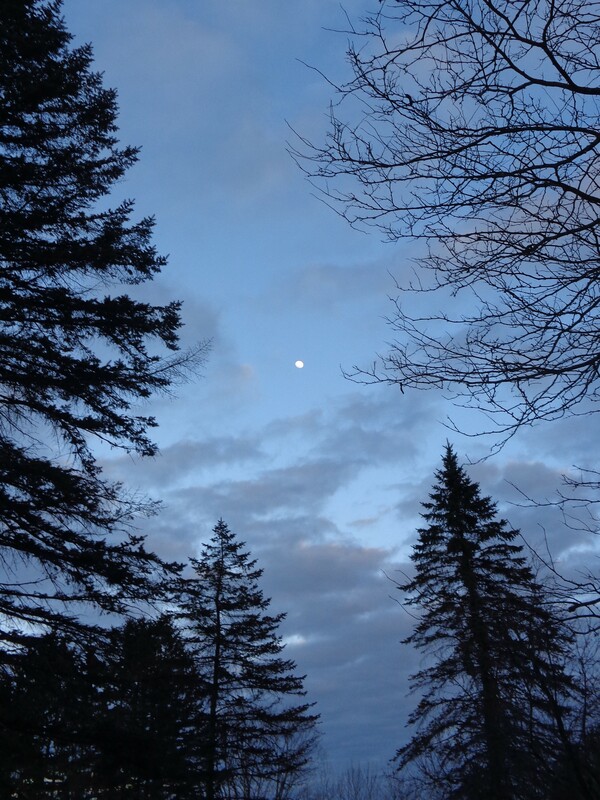 A gentle breeze stirs the treetops. Gulls cry high overhead, blending with the occasional sharp call of a bird-of-prey. Peregrine falcons nest nearby, although they don’t tend to make much noise. The park is home to osprey, eagles and various hawks. The predominant tree species is red spruce. Several squirrels rustle in the undergrowth collecting spruce cones. Nuthatches make petulant noises at one another as they scuttle along the tree trunks. The air is fragranced with the scent of fallen pine needles baking in the sun. In a few short minutes the end of the trail is near. A view opens of the sheer face of St. Sauveur, a 679 foot edifice that stands with its toes in the ocean. Soon the cove is in sight. 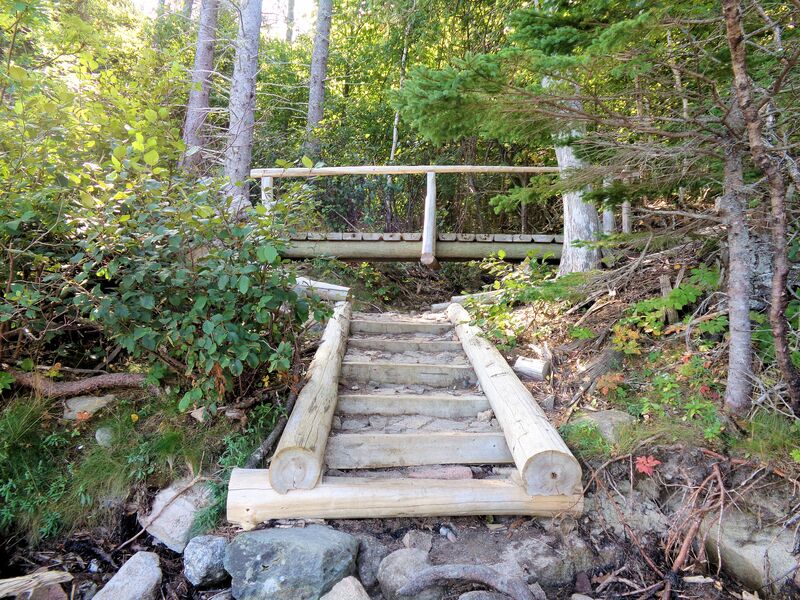 Access to the shore is by a newly constructed bridge and set of stairs. Trail repair is ongoing in this area. The loop to access the summit of St. Sauveur from the cove is closed due to trail deterioration. My hat is off to the workers, many of them volunteers, who haul material and labor mightily to maintain the hiking access at Acadia. 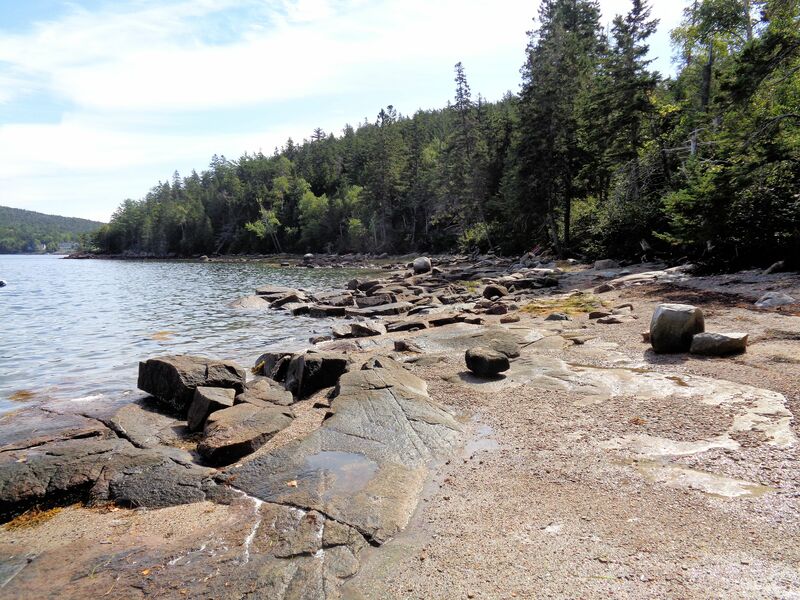 Valley Cove is part of Somes Sound, a deep inlet of the Atlantic Ocean that separates the two sides of Mt. Desert Island. 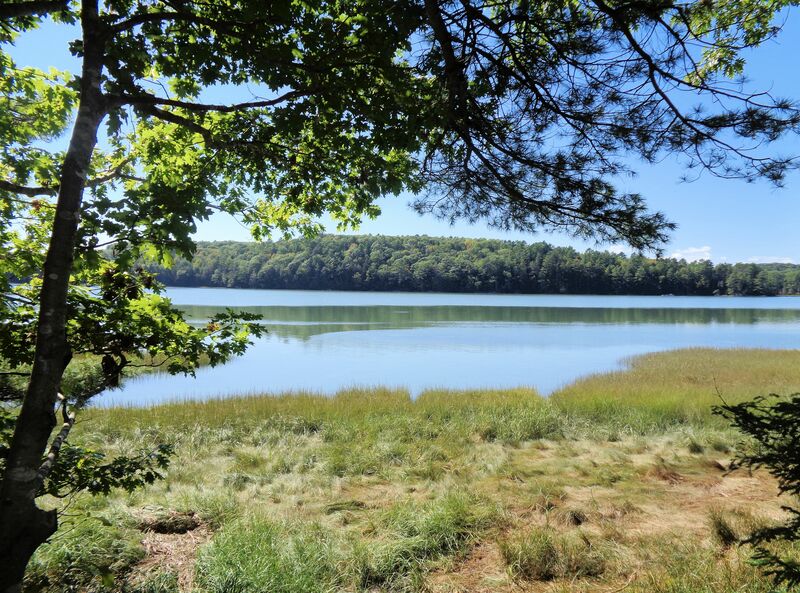 This beautiful place is on the “quiet side” of Acadia, away from the throngs visiting sights such as Otter Cliffs, Thunder Hole, Jordan Pond and the Spring House on the northeast arm of the park. While the southwest side sees plenty of visitors, we had the cove to ourselves this early fall day. The ocean is at its warmest now, although the temperature would be considered bracing by many. The clear water, slate and granite ledge, and coarse sand invite wading. On a hot day, this would be an excellent spot for a dip in the sea. Gazing northeast, the height of land to the left in the foreground is St. Sauveur, then the flank of Acadia Mountain (681 ft) and on the right side, across Somes Sound, is Norumbega Mountain (852 ft.) There are over twenty mountains on Mt. Desert, quite a feat for a little over 100 square miles of area! What we see today are just the stumps, the remainders of much higher mountains that were ground down by glacial ice sheets. The view to the south is of the side of Flying Mountain. 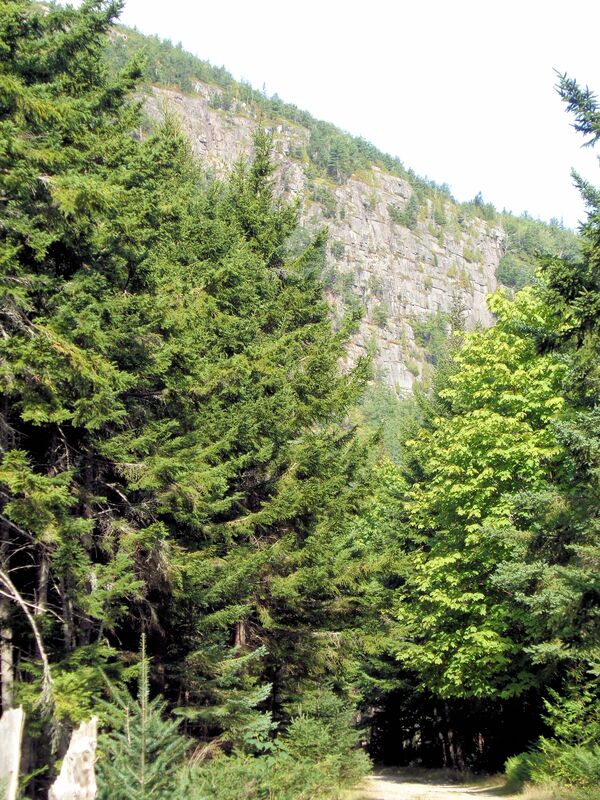 At 284 feet, it is the smallest peak in Acadia.